For the last couple of weeks, fans of Picnicface could be recognized by their gray pallor, caused by hours in front of the computer voting for the YouTube video awards. Picnicface's delicious parody for Powerthirst's uncomfortably energetic flavours is one of six finalists in the comedy category. According to the video site, hundreds of thousands of people voted, but sadly, Powerthirst didn't have enough "menergy," it lost to a bunch of a cappella-singing Harry Potter finger puppets (spoiler: they blow up), but not all is lost. Perhaps the best compliment for Picnicface, more glowing than any virtual trophy, is that a Port Arthur, Texas, car dealership totally ripped off the mock ad to make a real commercial for their Ford truck month. It's not too late to show legal love to your favourite comedy sketch group: Show up at their next show on April 6 or buy a t-shirt off picnicface.com. My vote for best shirt to wear east of Montreal or to your next city council meeting: "Halifax Hates You." 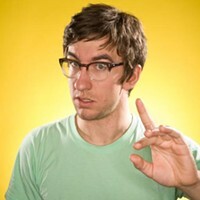 A brilliant solo comedian and Picnicface mainstay, Mark Little suffers the slings and arrows of his adoring public. And gives it right back.